This post originally appeared on Silent London, a blog you should all be reading on a regular basis. I don’t want anyone accusing me of ingratitude, much less of being a grouch. 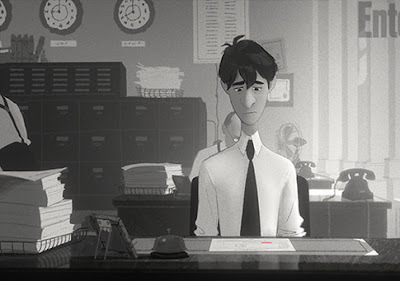 So I’m going to tell you all the reasons I think Paperman is wonderful, before I tell you why it’s not. Paperman has been rightfully lauded, you see. At least, if we’re talking about the animation itself, which, it seems to me, is the major preoccupation of those praising the film. Fair enough. In an industry fuelled by hype, Paperman is, legitimately, indisputably, a leap forward. 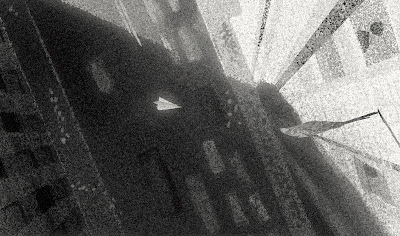 This is Disney’s newest cartoon short: a black-and-white film you’ll see just ahead of Wreck-It Ralph. Utilizing a newly developed program called ‘Meander,’ allowing them to draw traditional images over pre-constructed CG designs, Disney’s animators have created characters who move with the fluidity of 3-D animation, while possessing the warmth and expressiveness of a 2-D line. The effect is remarkable, and beautiful. 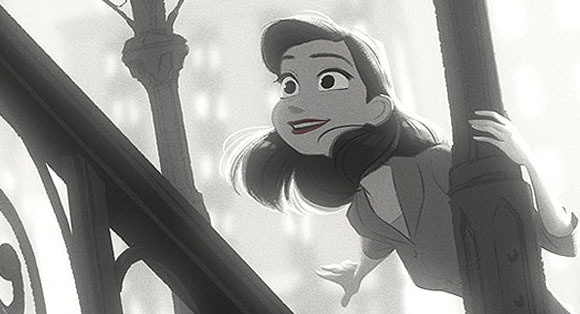 Paperman is set in New York City, in the 1940s. The film opens with two strangers: a man and a woman, both in their early-twenties, meeting on an elevated train platform, after the wind blows one of the Man’s documents into the Woman’s face. Her lipstick leaves a mark on the paper. He is smitten. So is she. As her train pulls away from the platform, she is looking out the window, back at him. It will become his mission to find her. The animation here is very… precise. Disciplined. This is the work of men and women with a clear vision: They knew they were making a cartoon, not an oil painting; and that a little exaggeration was for the best. So the wind nudges the man’s lanky frame just right—but not quite realistically. As the man himself does not look like a real man, but rather, a man rendered in Disney’s style, so too is his reaction a little more than it would be from you or me. I should add that this scene is dialogue-free, as is the rest of Paperman. It is ‘silent’, at least in the sense that WALL-E has been called silent. In fact, you hear lots of things in Paperman. You just don’t hear words. As in true silent films, the absence of chatter in Paperman allows us to focus on the visuals, and director John Kahrs is generous with them. I clearly remember the young woman’s smile: a half-smirk, half-grin she gives the Man after seeing the lipstick mark. You’d never see that look on a dame in a film from the ’40s, but it’s a familiar one among my friends today. Kahrs lets us savor it. The office where the Man works is likewise inspired. It’s a deadening workspace, recalling the fleet of identical desks in The Apartment (and of course, The Crowd), but on a smaller scale. The Man seems decades younger than his colleagues, all of whom frown at him. Watching the film a second time, I found myself wondering why he was there. If his job is entry-level, why is he the only young person in the room? Is he an intern? Is this during the War, and his peers are overseas? Maybe he’s the Boss’s son? The Boss, a severe fellow, had some of the qualities of a stern dad. And maybe a disappointed one. A seven-minute film cannot answer these questions, at least in any detail. But it is a credit to Disney’s team that they could create characters rich enough to inspire them. By the time the Man spies the Woman through a window in the skyscraper across the street—almost level with his own office, no less—we’re pulling for him; convinced he should and must get her attention. He begins folding his stack of blank forms (the symbols of the job he hates) into paper airplanes, whizzing them unsuccessfully above or below his target, or past her—and we yearn, with him, for one of them to connect. We can all relate, can’t we? We’ve all felt lost and powerless this way. Kahrs, describing his own experience of New York City to animation historian Jerry Beck, recalled how odd it was “to feel alone while being surrounded by people all the time.” We sense the Man’s aloneness too, and his loneliness. At this point, Paperman feels like a seven-minute version of Lonesome, the 1928 (mostly) silent film about two sad young people who meet, fall in love, and then lose each other in the wash of humanity that is the big city. Lonesome is a great film. But all good things must end. And in Paperman, the good things end before the film does. Explaining why is easy; doing so without spoilers is not. What I can say is that I was deeply, deeply disappointed by the ending of this film, not because of the outcome (a happy ending or a sad one would have been fine), but because of the mechanism. After several lovely minutes, built out of fine details, and true gestures, and hard-won audience investment rooted in believable characters doing believable things, the Man’s problem is finally solved through… magic realism. Boo to that. Boo to it for being a sudden turn, taking us out of one universe and into another. Boo to it for being unnecessary. Boo to it for being depressingly predictable—we’re suckers for this stuff nowadays, be it Twilight or Beasts of the Southern Wild. Why here? Why squander the good will and creative effort of the first four minutes of Paperman for a resolution that is (merely) splendid to look at? Admittedly, it is that—manic, well-choreographed, even funny, I suppose, if it doesn’t annoy you. And it may not. 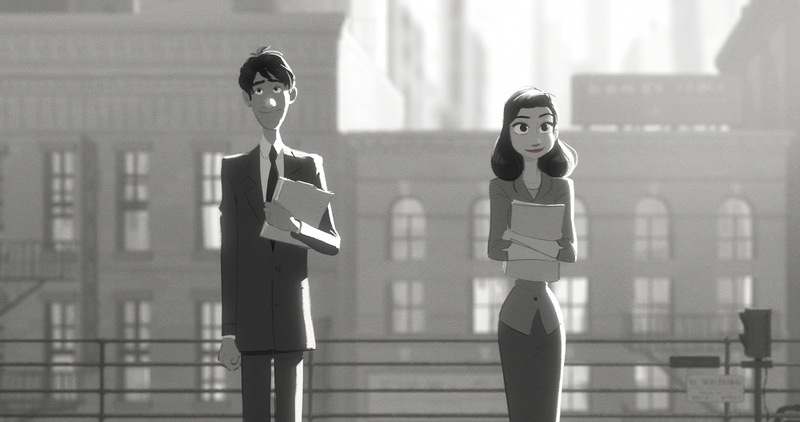 Many people will find the ending of Paperman delightful, and fully in keeping with what came before. They would tell me I’m nit-picking. But some would also, I think, tell me I’m asking too much from a cartoon. And they’d be wrong to do that. I say Disney can do better.